Brazilian dance troupe Grupo Corpo is no stranger to the BAM Howard Gilman Opera House stage. On Jan 31, the troupe returns to BAM for the fifth time for the US premiere of Bach & Gira, a two-piece performance that is both fresh and referential of Grupo Corpo’s decorated history and choreographer Rodrigo Pederneiras’ gift for boundary-pushing dance. Founded in 1975, Grupo Corpo sits at the forefront of Brazilian contemporary dance and is internationally renowned for blending idioms from modern dance and ballet with traditional Brazilian movement, while also continuing to challenge current understandings of how bodies relate to music and sound. Here’s a look back at 16 years of masterful performances. 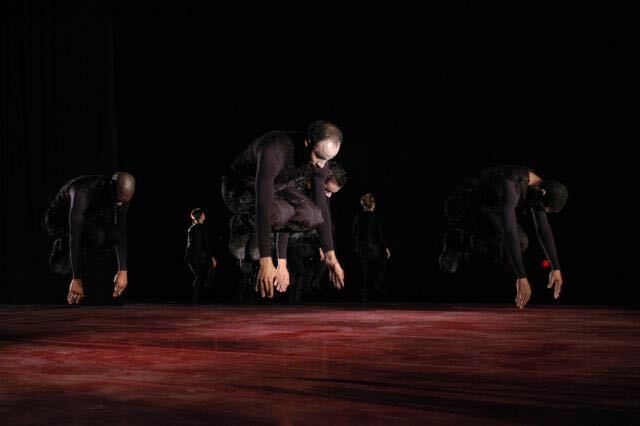 The troupe’s first performance at BAM, 21 and O Corpo, (2002) was a two-part production that showcased the connections and variances between hip-hop, traditional, and modern dance. 21 was a kinetic and musical exploration of the number and its myriad permutations while O Corpo was a dazzling movement re-mix set to a driving score by Brazilian pop idol Arnaldo Antunes. Grupo Corpo returned in 2005 for its second performance, Lecuona and Onqotô, which featured the music of Brazilian musician and activist Caetano Veloso—who has performed at BAM five times—set to 12 unique duets, each exploring the complexities of joy in love. With striking black and white patterned costumes, the troupe performed Benguelê and Breu in 2008: Benguelê, an exploration of Brazil's African, Arabic, and European dance roots; Breu, an aggressive and anxiety-filled work defined by a society bereft of communication. Finally, Grupo Corpo brought Ímã & Sem Mim to BAM for the 30th annual Next Wave Festival in 2012 with a signature blend of Afro-Brazilian, ballet, and modern styles enlivened by a contemporary electronic score. Check out the trailer (above) and take a look inside the BAMbill posted in our online Leon Levy Digital Archive, here. This week, Grupo Corpo will delight BAM audiences once again in a highly kinetic double bill, sure to be explored in our archives in years to come. For tickets and to learn more about Bach & Gira, click here.